Hutchinson’s Ryan Cornelsen has been a high school head coach for 12 seasons, but he’s never encountered the amount of injuries that he has in his first three weeks with the Salthawks. Running back and middle linebacker Colby Turner was injured in the preseason scrimmage. Wide receiver and free safety Conor Craig and quarterback Turner Wintz were hurt in the first game against Olathe South. Slotback and cornerback Spencer Cox was injured during last week’s game against Salina South. In all, Cornelsen said his team has endured three anterior cruciate ligament surgeries and three labrum tears. “This is more injuries in three weeks than I’ve ever had in my career as far as a whole season goes,” Cornelsen said. The Salthawks (1-2) hope the injury bug will end as they host the defending Class 6A state champion Derby Panthers (2-1) at 7 p.m. Friday. The Ark Valley Chisholm Trail I matchup will be featured on Friday Night Live. 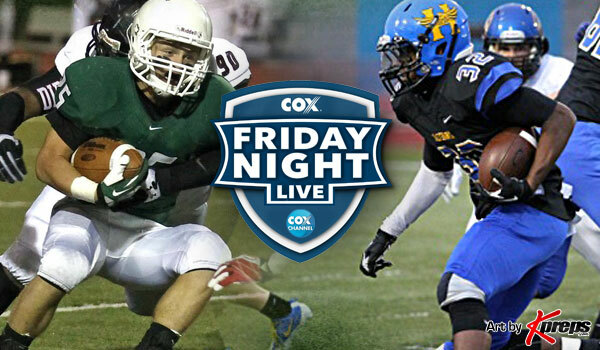 Derby and Hutchinson will be televised statewide on Cox Channel Kansas and then re-televised at 7:30 p.m. Sept. 28 and at 7 p.m. Sept. 30. Mark Ewing and Mark Davidson will be in the broadcast booth. Leon Liebl will be the sideline reporter. Hutchinson opened the season with a 24-2 loss to Olathe South before earning a 34-16 conference victory against Newton. Hutchinson fell 27-21 to Salina South this past Friday. Blaik Middleton rushed for more than 100 yards as a rusher and as a receiver last week against Salina South. The injuries have made it a difficult way for Cornelsen to begin his tenure at Hutchinson. Cornelsen, who has an 89-27 record as a head coach at LaCrosse, Hays and Hutchinson, replaced legendary coach Randy Dreiling after he left for St. Thomas Aquinas. Hutchinson hopes to get things rolling the right direction. Wintz, who passed for 147 yards against Salina South, is back from injury and will start at quarterback against Derby. Derby, which opened the season with a 20-13 loss to Maize, has bounced back with consecutive victories of 35-14 over Salina Central and Mill Valley. The Panthers returned zero starters on offense and only two on defense from last year’s star-studded championship squad. Derby quarterback Brady Rust completed 7 of 10 passes for 118 yards and two touchdowns in the win against Mill Valley. Rust also ran for 94 yards on 18 attempts. Derby running back Curtis Whitten, a transfer from Wichita Heights, rushed for 122 yards and two touchdowns on 22 carries against Mill Valley. Panthers senior Darreon Jackson, a transfer from Texas, is a Rivals.com three-star recruit as a defensive back. Clark raved about Hutchinson’s defensive line and said he believes the Salthawks’ record is a little misleading. Derby won last year’s meeting 36-0. Hutchinson eliminated the Panthers from the playoffs in 2012.